I thought it would be nice to share some of the clever ideas that can be used when designing kitchens with awkward areas. 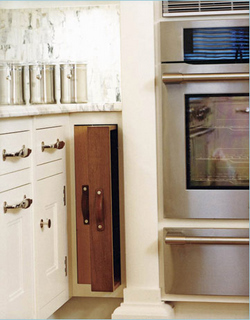 This photo from House Beautiful shows serving trays nestled in a small corner. Other options for a space like this include small shelves for a rolling pin, rolling cloth and biscuit cutters for someone who bakes often.